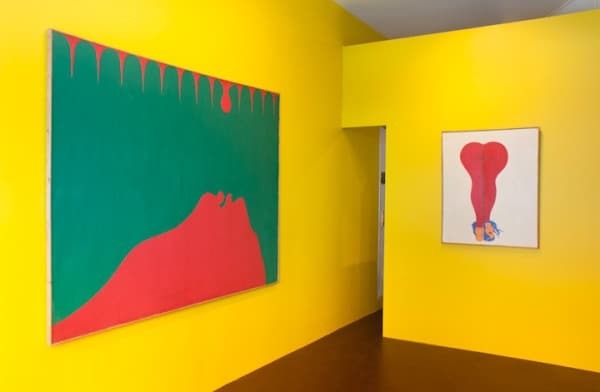 Between 10th of April and 4th of May 2013, Oko in New York hosted the very first American presentation devoted to artist Jerzy “Jurry” Zieliński (1943-1980) – one of only a handful of Polish artists to take up the pop art style during the 1960s and ’70s. Contemporary Lynx had the pleasure to talk to the curator of the show – Alison Gingeras. She is an acclaimed international curator – a former curator at the Guggenheim Museum in New York, Centre Pompidou in Paris and then at François Pinault’s Palazzo Grassi in Venice. Her latest curatorial platform, Oko, (Russian for “eye”) is a 110 square-foot storefront in New York’s East Village, that presents aesthetically provocative exhibitions. Jerzy “Jurry” Zieliński exhibition included three key paintings; Irony, (1970) Polish Act of Marriage, (1974) and Meeting (1969) that together offer a condensed first look at Jurry Zieliński’s oeuvre. Zielinski is one of the rare Polish artists influenced by pop art style during the 1960s and ’70s, he made works repleted with anti-establishment messages. His artistic language did not develop as part of the western canon. It shows a unique application of pop art in Eastern Europe, outside of where the movement originated. Jurry’s pop art is exceptional, because it did not focus on consumerism, but rather was a vehicle used to scrutinise the communist regime, as seen from the Polish perspective. Lynx: Alison, the post-mortal exhibition of a post-war artist – Jerzy Jurry Zielinski curated by yourself at Oko has finished recently. This was the first presentation of the artist’s works outside of Europe. The show was organised by Oko with the support of Zderzak Gallery and the artist’s widow Wieslawa Zielinska. I would like to ask you, what was the trigger to organise this exhibition? How the idea of presenting his artwork at Oko came about? A.G.: About two years ago, I was in a bookstore in Warsaw and came across the publication “Jurry. Powrot Artysty” (Krakow 2010) that had just been published. I was completely obsessed by this artist I had never heard about. I eventually got in touch with Zderzak Gallery in Krakow who manage the Estate and proposed to organize a show in New York. I found the work to be visually and conceptually compelling – and thought it would be important that it be seen in America. Lynx: Zielinski’s works are compared to Japanese avant-garde artist Yoko Tadanori or Heinz Edelman. But what is special about Zielinski’s work? What really makes his contribution into the international pop art scene? A.G.: Jurry represents a singular position – especially when taking into account the cultural and political context in Poland at the time that he is making this work. I think it is important that in New York City – one of the “birthplaces” of pop art and this type of aesthetic – that an artist like Jurry is considered outside of the hegemonic narrative of Anglo-American pop art. From the reactions we had to the exhibition, I witnessed that his very idiosyncratic iconography and narrative threads that run throughout the work still have a strong legibility and resonance today. Lynx: Today Zielinski is considered as an uncompromising pop art Pioneer in 60s and 70s in Poland. He used pop art style to criticize the communist regime. However, he has been completely forgotten in Poland for about 20 years. For instance, you would not find his work in art publications. How could the younger generation understand this fact? A.G.: As I am not Polish, I don’t think I am qualified to explain why Jurry’s work has been received this way in Poland. Its clear that there’s been at least two decades in which his work has not been appreciated or perhaps even repressed from the mainstream of Polish art history. I hope that our modest exhibition will bring awareness to his work for a younger generation. Lynx: With this exhibition, Oko introduced Zielinski to the broader audience. This is his first show in New York. What was the reception of his work by NY visitors, critics, collectors, curators and artists? A.G.: We had a very positive response to the show – by young artists, critics and curators as well as the general public. People of an older generation who lived during the Cold War were very intrigued by the history of Jurry during the PRL times and the younger audience seemed to connect very strongly to the singular aesthetics of his work – and were astonished by the resonance with American Pop. I believe a number of international curators have become aware of Jurry’s work and he is being considered for some important thematic exhibitions in the years to come. Lynx: Oko is known for presenting curatorial experimentation. Could you tell us more about your curatorial activity and about Oko’s programme? Does Oko show Polish art frequently? A.G.: Oko is like a little laboratory where we can organize small exhibitions that are hopefully aesthetically provocative or come from a less expected point of view. We do not only focus on Polish art — our first show was a performance artist from the East Village called Danny Mc Donald. After that we organized a very specific show exploring the early work of Julian Schnabel from 1978 – 81. Since closing our Zielinski show, we opened an exhibition of new “fairy dust” paintings by Dan Colen juxtaposed with a Victorian Fairy painting from 1851 by John Fitzgerald. I suppose this eclectic vision is an essential part of Oko’s own identity. Lynx: I would love to find out what the atmosphere at East Village is like? Does it have a strong bohemian artistic climate? A.G.: The East Village is still a hub of artistic and cultural activity. Not only do many artists live in the neighborhood, it is also an anchor for numerous institutions such as NYU (New York University) and Cooper Union so we have a big student population. It is also traditionally a Polish and Ukrainian neighborhood–I hear lots of people speaking many languages on the streets of the East Village. Our street is dominated by Japanese shops and restaurants… its like 2 streets of little Tokyo. Its a classic NY melting pot. Oko– located in an East Village storefront, Oko (oko is the Russian word for ‘eye’) is an art exhibition space conceived by Alison Gingeras in collaboration with Luxembourg & Dayan gallery as a venue for curatorial experimentation. Deliberately modest in scale, this ground floor venue in a typical 19th century tenement building on East Tenth Street draws its inspiration from the iconoclastic spirit of the neighborhood and the district’s history as an incubator for innumerable cultural breakthroughs. “Oko” is also polish word for eye. Maybe even more polish for it’s not written in cirillic. The spelling is the same.